In this review of the Daiwa Tatula CT Type R which was first brought to market in 2017, we will take a look at how Daiwa has been improved upon as compared to the original Daiwa Tatula CT.
Basically, the Tatula CT Type R is a souped-up version of the Tatula CT which has been upgraded to include a few cosmetic things like its racing red paint job as well as more importantly upgraded “CRBB” Corrosion Resistant Ball Bearings, a spool made of A705 Aircraft Grade Aluminum, and an overall reduction in weight of 0.2 oz. The Daiwa Tatula CT Type R is available in 3 gear ratios to suit different types of fishing. Another great baitcasting reel from Daiwa in the $150 range for inshore fishing. Very smooth 7 ball bearing reel with a good 13.2 lb drag. Solid lightweight aluminum frame and side plate. The Daiwa Tatula CT Type-R is an excellent choice in a low profile baitcasting reel that does not break the bank. Available HERE. There are a few things that we really like about the Daiwa Tatula CT Type R, such as that the body is ever so slightly smaller in the palm of your hand and it weighs in at about a 1/4 less than the Tatula CT. While this is subtle in size, it seems to make a big difference when using the reel all day. 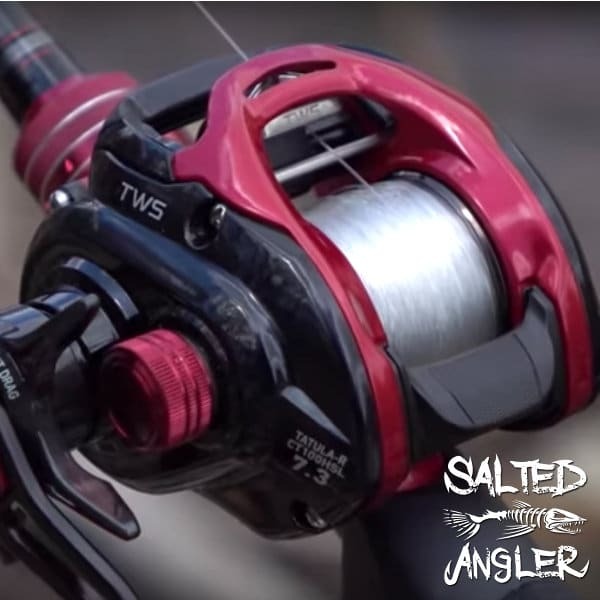 One of the classic features we love on this reel is the use of Daiwa’s T-Wing system for line control which we have found to be one of the better alternatives on the market today. 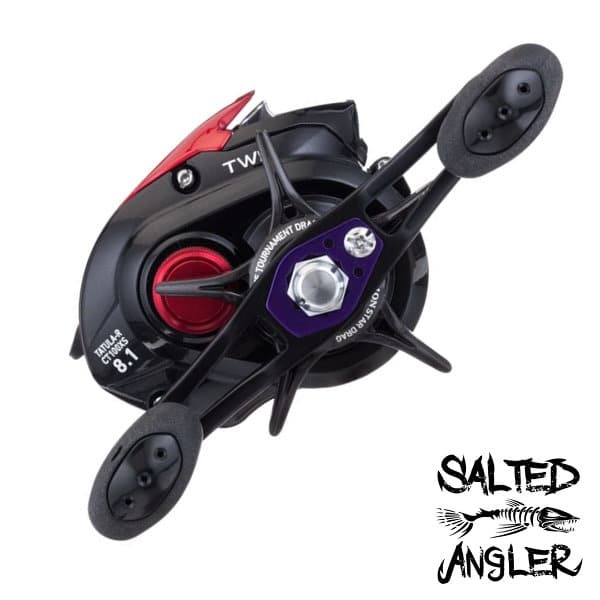 T-Wing System (TWS – Long cast with minimal backlash) – Daiwa’s T- Wing System solves a couple of common and annoying issues that occur with baitcasting level-wind reels – friction when casting and uneven line intake when retrieving the line. The innovative design of the “T” opening allows the line to flow freely through the wider top section when casting. The wider gap reduces the traditional friction that can occur from a regular baitcaster reel where the narrower gap causes the line to slow down when casting thus reducing the distance of your cast. When you go to retrieve your line the T portion of the guide drips down into the reel and the line is now in the narrower section of the T- Wing for even distribution across the spool. 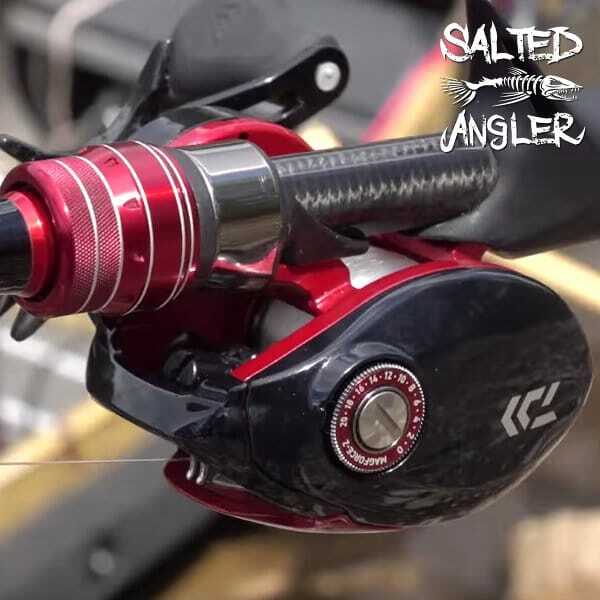 Lightweight aluminum frame and side plate (gear side) – The Tatula CT Type R boasts a lightweight aluminum frame and side plate (gear side) that reduces overall weight and will stand up to saltwater fairly well. Magforce Z Cast Control – Daiwas answer to combating the issue of backlash is the Magforce Z system. With Magforce Z the line comes off the spool very quickly at the start of your cast and then slows down as you near the end of the cast. What this means is that you are able to achieve a further and seemingly smoother cast with the same amount of effort. Daiwa uses an inductor cup between the magnets to apply slow, “magnetic braking,” which prevents the overrun that is so often prevalent at the end of a cast. Basically what happens is that as the spool begins to slow down more and more braking power is applied by the magnets. A dial is located on the side-plate that allows you to fine-tune the amount of braking power to suit your particular situation. Air rotation – Daiwa’s Air Rotation System facilitates a smoother feel with effortless winding and free spinning rotation of the handle. The air rotor weighs 15% less than a standard rotor and is designed to evenly distributes stress across the entire reel. A7075 Aircraft grade aluminum spool – The use of A7075 Aircraft grade aluminum in the spool allows for a combined lighter weight as well as additional strength when compared to traditional aluminum. It is also felt that the A7075 aluminum will stand up to harsh saltwater conditions better. 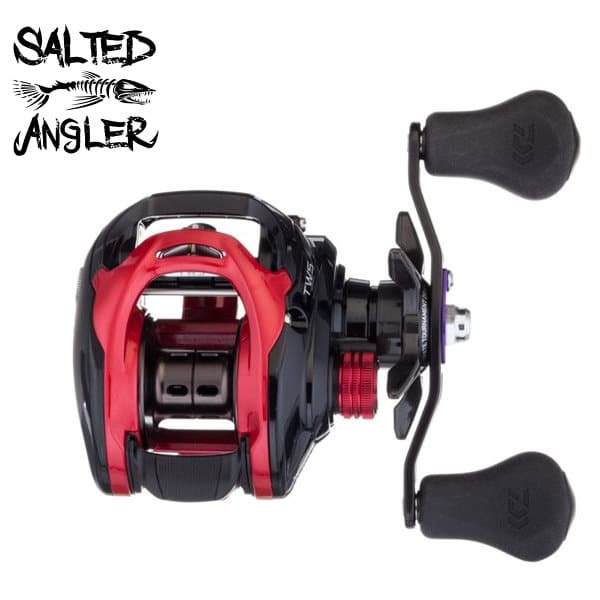 Zaion Star Drag – The star drag on the Daiwa Tatula CT Type R is made of a material called Zaion developed by DAIWA to built reel bodies, rotors, and drag handles. The big advantage of this material is its weight and strength. Zaion is a kind of “High Density” carbon strain material, which is made for highest performance and to resist maximum impact. 2CRBB+5BB+1RB – The Tatula CT Type R uses an 8 bearing system (2+5+1) The 2 main bearings are Corrosion Resistant Ball Bearings (CRBBs). These ball bearings are treated stainless steel ball bearings that are designed to provide up to 12 times the normal life expectancy of steel and will hold up much better under harsh saltwater conditions. Additionally, there are 5 bearings on the interior of the reel and 1 roller bearing. Ultimate Tournament Drag (UTD) with up to 13.2 lbs. max – The UTD or Ultimate Tournament Drag is comprised of over-sized carbon fiber drag washers that are placed on either side of the spool and allow for even distribution of the force on the spool. This design results in an extremely smooth drag at all settings and at a maximum setting of 13.2 lbs is big enough to bring in all type of larger fish from Bass to snook, gator trout and bull reds. Cut-away 90mm swept – The large cut-away swept handle design allows you to have a large handle that at the same time feels compact. This design places the knobs closer to the main body of the reel. By getting the handles in closer you not only create a much better experience when fighting a larger fish, but you also have the feeling that there is less wobble or side ot side movement since your hand is closer to the centerline of the reel and rod. Ultimate Tournament Drag (UTD) up to 13.2 lbs. When Daiwa redesigned the Tatula CT Type R they made the spool deeper which allowed them to pack the same amount of line on a spool that was narrower making the overall reel easier to palm. 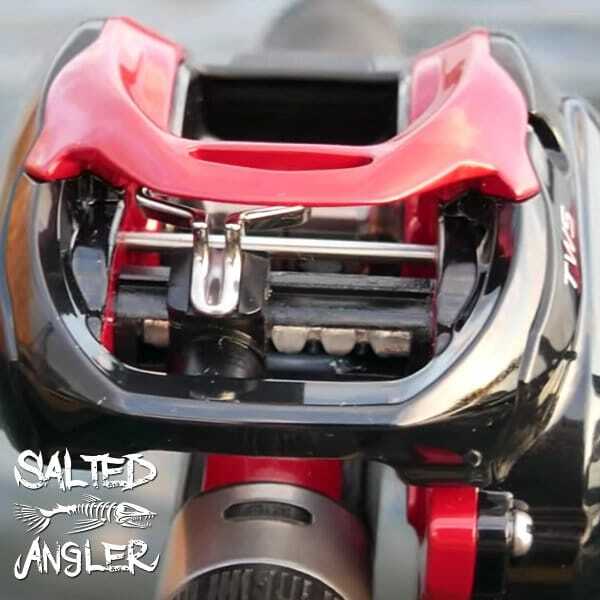 What really separates the previous model of the Tatula CT from the Tatula CT Type R is the corrosion resistant bearings which is really important for us saltwater fishermen and women. When testing the reel on the water I was able to cast very accurately as the reel was very consistent across many weights and types of baits. The adjustment dial on the side plate allows you to fine tune the reel very easily and in small increments without having to open up the sideplate. I find that the open design of the T-Wing System makes a big difference over conventional line control systems especially when pitching heavier baits. In all of my testing, I did not get one backlash and I must admit that I use a spinning reel a lot more than a baitcasting reel. I know for a fact that I can attribute the lack of backlashes to the awesome Magforce Z cast control system. Lightweight at just 7.2 0z. Solid Drag at 13.2 lbs. The first obvious choice would be the Daiwa Tatula CT which is the predecessor to the Daiwa Tatula Ct Type R. This reel is going to save you about 25% in cost. So what do you give up? For your 25% savings, you will not get the slightly smaller and lighter weight body and the corrosion resistant bearings. 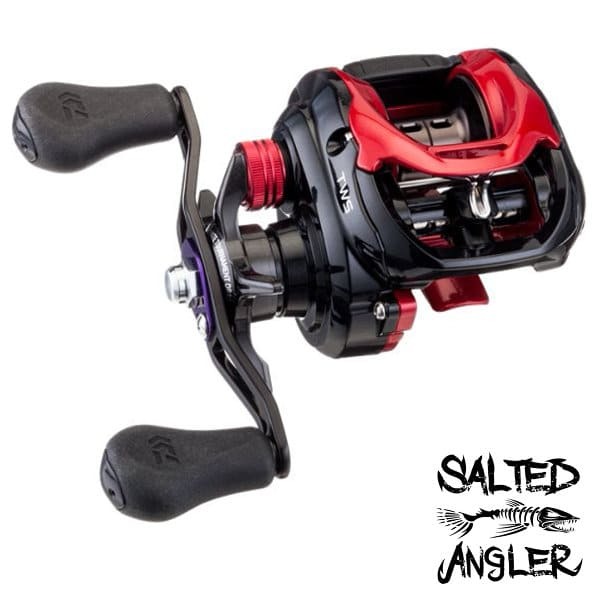 Check out the lowest price on the Daiwa Tatula CT HERE. 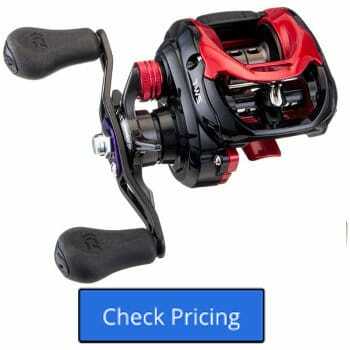 Another good reel in this price range is the 13 Fishing Concept A Casting Reel. With a weight of only 6.7 oz. it is 1/2 oz lighter than the Tatula CT Type R and it packs 22 lbs. of drag with the Bulldog drag system which when combined makes for a small and comfortable casting reel. The 13 Fishing Concept A has their version of the TWS which they call the Arrowhead line guide system. You loose one ball bearing but they are now all corrosion resistant and this is a very smooth reel. Like the Daiwa Tatula CT Type R, the 13 Fishing Concept A reel is lightweight, durable and ergonomically comfortable. Read the full 13 Fishing Concept A review HERE. If you want to step your game up a little in weight and performance I would have you look at 2 more reels. From Daiwa take a look at the Daiwa Zillion SV TW which has a price point of about 35% more. So what do you get? First, a body that is made completely of the proprietary Zaion material like the star drag on the Tatula CT type R that weighs only 6.9 oz. You also get the upgraded SV spool and the Daiwa Air Brake System. Read the full Daiwa Zillion SV TW review HERE. From Shimano take a look at the Shimano Curado 70 which most consider a freshwater reel, but Shimano themselves rates for saltwater. The Shimano Curado 70 is going to be about 35% more in cost but what you get in exchange for those additional greenbacks is the Shimano brand and a reel that weighs only 6.5 oz. You do give up a little drag as the Shimano only blasts 10 lbs. of drag as compared to the Daiwa’s 13.2 lbs. Read the full Shimano Curado 70 review HERE. 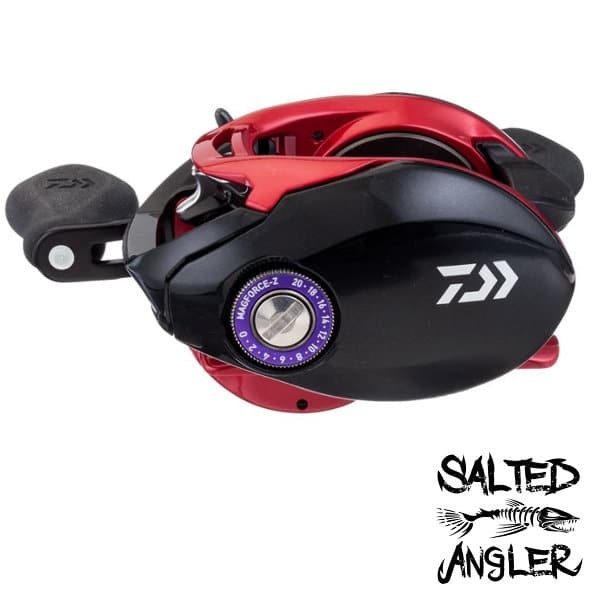 The consensus among anglers we have talked with is that the Daiwa CT Type R is a workhorse baitcasting reel with a very comfortable weight and profile making it a go-to for fishing all day without feeling fatigued. When compared with other reels in its price range we feel that the Daiwa Tatula CT Type R is a solid purchase that should last for years of fishing fun in either fresh or saltwater.